Denver is putting $26 million into creating a new front door for downtown - Denverite, the Denver site! With no curbs, bike lanes or sidewalks, Brighton needs a makeover to serve as RiNo’s Main Street. Jun. 25, 2016, 7:30 a.m.
Brighton Boulevard has served as downtown Denver’s industrial back door for decades. With no curbs, bike lanes or sidewalks, it needs a makeover to take on its new roles of gateway to downtown and Main Street for the River North area. Denver is investing $26 million in the redevelopment of the corridor, which connects the stock show and Globeville, Elyria and Swansea with the River North area. The road also skirts the new University of Colorado A Line station at 38th and Blake streets, where the city plans more intense development. The redevelopment project creates two, 12-foot-wide lanes in each direction between 29th and 44th street and adds three new traffic signals. The plans call for 5-foot-wide sidewalks and a 6.5-foot-wide separated bike track. There will be curbs and gutters, trees and benches, turn lanes and on-street parking. People who care about street design mostly like what they see, though the intersections are still pretty car-oriented. Denver did drainage work along the corridor earlier this summer and is now on to utility relocation. Over the next 60 days, the city will open bidding on two portions of work, Brighton from 29th to 40th and Brighton from 40th to 44th and the Globeville Landing outfall, part of the Platte to Park Hill drainage projects. Construction should start in September or October and continue through 2017. The newly formed RiNo General Improvement District assesses special property taxes on businesses and homes along the corridor to pay for some of the extra amenities and for their long-term maintenance. 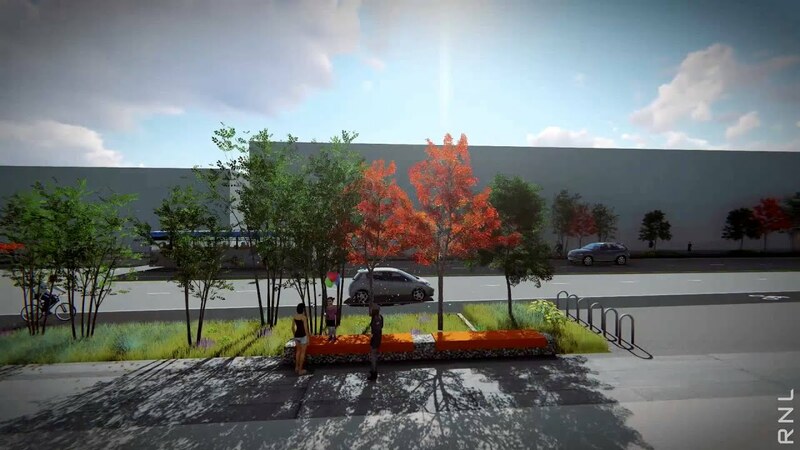 A second phase of the project will similarly spruce up Brighton Boulevard between 44th Street and Race Court as it passes the National Western Center. That project will enter the design phase this year, but construction won’t happen until 2018. Funding for this phase has not been identified.